RT's Abby Martin sits down with Academy Award Winning Director, Oliver Stone, and Historian Peter Kuznick, to talk about US foreign policy and the Obama administration's disregard for the rule of law. 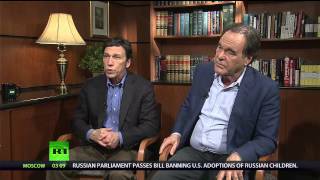 Film maker Oliver Stone and historian Peter Kuznick were interviewed by Russia Today, RT, and the tone was very negative towards Barack Obama. Oliver Stone: "Obama a wolf in sheep's clothing"
Dec 29, 2012 · Some interview highlights: Oliver Stone: (Obama) I think under the disguise of sheep’s clothing he has been a wolf. . . . That is what is sad. Oliver Stone: Obama A Wolf In Sheep`s Clothing. Stone is interviewed and talks about US foreign policy and the Obama administration`s disregard for the rule of law. RT.com: RT: It took both of you almost five years to produce this series. And in it you have a chapter called Obama: Management of a Wounded Empire. The creators of the Untold History of the U.S. documentary series on Showtime expose Obama as a wolf in sheep’s clothing. Hollywood Marxist Oliver Stone: Obama A Wolf In Sheep’s Clothing ... Oliver Stone: I think under the disguise of sheep’s clothing he has been a wolf.